If you’ve ever stuck to a low-carb or keto diet for a significant amount of time, it’s likely you’ve found some form of success. 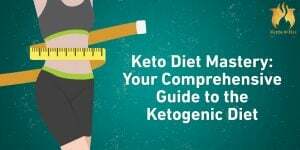 Whether your goal was weight loss or to remedy a metabolic health condition, keto and low carb diets have shown time and again to have high success rates when followed properly. It’s also possible that, after the first month or so went super well, your weight loss began to plateau. Weight loss plateaus can happen for a number of reasons. Whether you begin to slowly slip higher-carb or higher-calorie foods back into your diet or simply reach a weight that requires a reduction in calories to lose more, plateaus are common on any diet plan. While we at Kettle & Fire don’t advocate for rapid, quick-fix weight loss fads, it can be helpful from time to time to supercharge your keto efforts by spending a few days cleansing. Cleansing for you might mean a bone broth cleanse or a version of intermittent fasting that works for you. Today we’re going to explore the Keto Soup Diet, a form of cleansing that, just like the bone broth cleanse, is meant to be temporary (usually about five days). Is Keto Soup Just a New Version of the Cabbage Soup Diet? Chances are, if you’ve struggled with your weight at any point in the last 10 to 20 years, you’ve heard of Atkins, and you’ve heard of the cabbage soup diet. Back in the 1990s, the seven-day cabbage soup diet was a fad that swept the nation alongside the low-fat craze. It essentially involved making a soup of cabbage, tomatoes, and a few other vegetables and eating it alongside raw vegetables for seven straight days, to the exclusion of all other foods. At the heart of this diet was a dramatic reduction of overall calorie intake, which was supposed to induce rapid weight loss. The problem was that it was a virtually protein-free diet without enough nutrition to prevent muscle wasting. Rest assured, the Keto Soup Diet is not the cabbage diet. A quick Google search might reveal a bit of conflation in these two approaches, but there’s a difference. The cabbage soup diet involves a sharp reduction in calories, contains very little, if any, fat, and no meat. The Keto Soup Diet is a soup-focused, stricter meal plan that uses keto principles. In other words, you’ll still be eating low carb, high fat (LCHF) on the Keto Soup Diet, with a few additional restrictions. Namely, you’ll be eating a nutrient-dense, high-fat soup every day for five days, alongside other nutrient-dense, high fat foods from a limited menu. After the five days are over, you can go back to your favorite low-carb, paleo, keto, or otherwise healthy recipes, enjoy keto desserts, or any other foods that fit your chosen diet plan. Again, this plan is just meant for a five-day stretch. Why Is This Diet So Effective? This diet is effective because it’s specific, easy to follow, requires one day of meal prep for the whole five days and, most importantly, it’s temporary. You can do just about anything you set your mind to for only five days, right? The easy keto recipes are formulated with a specific caloric and net carb total, leaving nothing to chance and no room for deviation. You make everything in advance, and you follow along for five days. A major advantage of the Keto Soup Diet over the cabbage diet and other low-calorie fad diets is that the soup is not only a delicious low carb recipe, but it’s also filling and satisfying. It includes low-carb root veggies like celery root, radish, jicama, and turnip, which offer a healthy alternative to the starchy veggies you end up foregoing on the standard ketogenic diet. And it avoids muscle waste by including high quality protein from chicken breast and bacon as well. There are specific limitations to this diet that should be followed to the letter, such as going dairy-free (including the cream in your coffee), avoiding nuts, and eliminating all sweeteners, even the calorie-free ones. This strict limitation is just for the five days you’re on the diet. Once it’s over, you can go back to having your fat bombs and other favorite keto treats. Who Came Up With This Diet Plan? 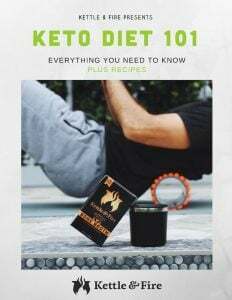 The Keto Soup Diet originated on a blog created by Mellissa Sevigny called I Breathe I’m Hungry (IBIH). A culinary expert and published author, Sevigny began her low-carb, gluten-free, keto journey in 2011 as a recipe blogger hobbyist and has now become a best-selling cookbook author. She developed the Five Day Keto Soup Diet as a way to help keto and low-carb dieters jump-start their weight loss, and it’s blossomed into an incredibly active movement on social media and her blog. The Keto Soup Diet features three to four main recipes, which involve simple ingredients that you can knock out with a single shopping list at the grocery store the day before you’re ready to get started. Essentially, for five days, you eat eggs, bacon, and avocado for breakfast (along with fatty coffee), a delicious vegetable soup (which also features bacon and chicken breast!) for lunch and dinner, and either egg, tuna, or chicken salad on lettuce cups for a snack. It’s that simple. For a full rundown, including shopping lists and recipes, check out her Keto Soup Diet meal plan page and her Facebook group. How Should You Transition Your Diet? After five days on a Keto Soup Diet, you’ve likely jump-started your metabolism and are feeling great. The best way to keep things going in the right direction is to transition to other simple keto recipes and keto soups. You can focus on brothy options like chicken soup or Kettle & Fire’s Miso Soup, which requires no meal prep and offers 11 grams of protein per serving. Finding easy keto-friendly soups that are pre-made will help you cut down on meal prep and increase the likelihood that you’ll stick to your plan. Other options are creamy, blended soups, like cream of mushroom soup, cauliflower soup, or Asian-inspired soups with a chicken broth and coconut milk base. We’ve collected some of our favorite soups for busy people, which you can bookmark and refer back to to help you plan for your transition. It’s also a good idea to opt for Instant Pot or Crock-Pot (slow cooker) keto soup recipes to help you cut down the time you spend in the kitchen. The best long-term diets are the ones you can stick to, so rely on your favorite soup recipes as healthy comfort food options as you transition off of the Keto Soup Diet.